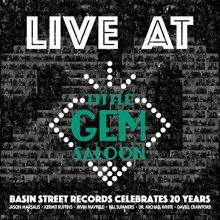 Started in 1998, New Orleans-based record label Basin Street Records has released Live at Little Gem Saloon to celebrate their 20th anniversary. 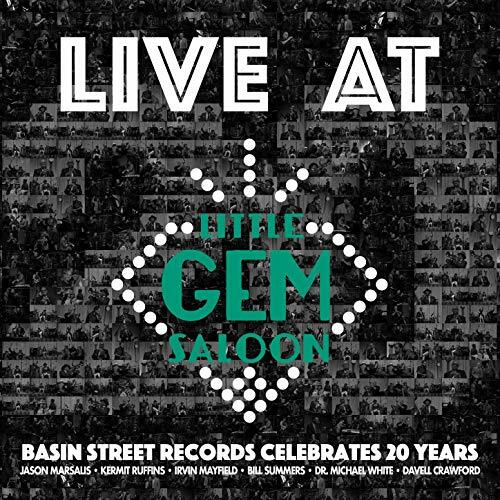 Recorded at the historic French Quarter saloon on May 5, 2017, the nine-track album includes performances from an all-star lineup of local artists. Featured performers include vibraphone master Jason Marsalis who offers two originals, “Bourbon Street Ain’t Mardi Gras” and “At the House, In Da Pocket.” Clarinetist and jazz historian Dr. Michael White improvises on a swinging rendition of “Summertime” and his original “Give It Up (Gypsy Second Line),” trumpeters Kermit Ruffins and Irvin Mayfield join forces on a couple of standards, and pianist/vocalist Davell Crawford brings the project to a rousing close with a bluesy rendition of Luther Dixon’s “Big Boss Man” and his original medley “Don’t Ever Be Blue/Ode to Louisiana.” Live at Little Gem Saloon captures an evening of new music and standards by jazz musicians in honor of Basin Street Records’ two decade long commitment to representing New Orleans-based jazz, blues, funk, and R&B artists. This entry was posted in Jazz and tagged Basin Street Records, CD review, Chloe McCormick, Jazz, Live at Little Gem Saloon, Various Artists by aaamc. Bookmark the permalink.